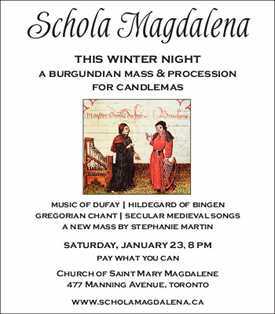 The music of Guillaume Dufay is not often heard live in Toronto, though he is acknowledged as one of the most influential composers of the early Renaissance. Dufay was part of the 15th-century brain drain that drew talented northern musicians from Burgundy to pursue jobs and money in sunny Italy. Dufay served several aristocratic Italian patrons, as well as the Papal chapel, and travelled widely, gathering new compositional styles everywhere he went. Part of the appeal of Dufay’s music is that it does sound very modern and unpredictable, yet it evokes the sense of a mysterious and elegant time long past. The first part of our program is woven around Dufay mass movements, including an Agnus Dei from his Missa Se la Face ay Pale. This mass is based on a love song that says “If I look pale, it’s because I’m in love.” We’ve strung together hymns, motets and mass movements on the common theme of the adoration of the Virgin Mary. We’re very excited to be performing for the first time with authentic Renaissance instruments. Our second half is an imaginative interpretation of a Candlemas procession, interspersed with several “stations.” At the Lady Chapel, we sing a short missa brevis; at the Statue of Our Lady, we sing music by the 12th-century abbess Hildegard von Bingen; at the west door, we indulge in some secular songs; at the font, some 15th-century English polyphony; and we conclude with the Antiphon and Nunc Dimittis for Candlemas.